Though the song’s repetition frustrates the ball scene’s youngsters (“This song is a classic,” Dominique Jackson’s elder stateswoman, Elektra Abundance, retorts with a sniff), Pray’s rationale for playing it is, in fact, the clarion call of Pride: Pride is presence, the refusal to be shouted down, erased, ignored, shamed. It is also, of course, resistance: Pride originated with the first anniversary of the Stonewall riots, in which queer people of color—those at the bright, unabashed heart of Pose—played a central role. Long before “Love Is the Message” offers up back-to-back renditions of “For All We Know” and “Home,” then, the episode, co-written and directed by Janet Mock, emerges as the message’s proof, the installment of FX’s blistering drag/dance musical that best encapsulates Pray’s admonition against hiding. In this sense, more than “I Like It,” “Slow Burn, “Boo’d Up,” or any of the other contenders, Pose is truly the song of this summer, an ecstatic, mad hot bop for a season of rage. After all, as Pray suggests, the song that defines a particular moment isn’t necessarily the track at the top of the charts: Pose itself conjures up the raucous queer counterculture of Gordon Gekko’s New York with reference, among others, to Desperately Seeking Susan, Whitney Houston, Falconcrest, and Anna Wintour. (Some things never change.) The point is, an electric melodrama of warring houses set within a wider crisis seems more than à propos for the summer of 2018, a sort of Babylon Berlin for our Republican Reich: Pose is an object lesson in the ongoing nature of struggle, full of shape shifters, fierce queens, underdogs, wits, all scrappers to the last. (The same can be said of both its on- and off-screen talent, which includes trans women writers Our Lady J and Mock—now the first trans woman of color to direct an episode of television—and the largest cast of transgender actors in the history of scripted TV.) Against the personal and political troubles met by protagonist Blanca Rodriguez (Mj Rodriguez), an HIV-positive trans woman of color who breaks with Elektra in the pilot episode to form her own house, the battles ahead—in the midterm elections, against a Supreme Court that threatens to roll back or blockade LGBTQ rights, for an end to the murders of trans women and the epidemic of queer youth homelessness, toward a future in which the AIDS crisis is actually over, and not just in the fantasies penned by privileged white men—appear only as consequential as they always have. Pose simply reminds us, more in the furious vein of Angels in America and The Normal Heart than the maudlin one of Philadelphia and Dallas Buyers Club, that the fight for our lives was and remains literal: Queer people don’t need Gilead to imagine a nation that wishes us dead. After all, the work continues apace. Gay bars may no longer ban trans women outright, as Blanca finds night after night in “Access,” but racism, fat-shaming, femme-shaming, and transphobia are commonplaces in both public spaces and on apps like Grindr. An HIV diagnosis may no longer seem like a death sentence, at least in some quarters, but because of the stigma still associated with it, the fear of getting tested that Pray and the Evangelista boys express in “The Fever” registers as all too real. On the concept of “passing,” on gender confirmation surgery, on the estrangement from intolerant family members, and on much more besides, Pose is as fresh as the floral pastels of the Mother’s Day ball. Even its most misconceived subplot, involving Angel’s paramour, Stan (Evan Peters), his sympathetic wife, Patty (Kate Mara), and his cutthroat boss, Matt (James Van Der Beek), contributes, if ham-fistedly, to the series’ potent rejection of historical “progress,” its fervent call to keep fighting: Stan and Matt are colleagues at the Trump Organization, foot soldiers in the same force that’s been trying to kill us all along. Firing shots across the bow of dramatic convention from its opening sequence—in which Elektra shoots down the idea of a “superhero”-themed ball with the devilishly funny line, “Why don’t you just give Mother a Sominex instead?”—Pose, following Murphy’s astonishing The Assassination of Gianni Versace: American Crime Story, understands intuitively that the form of queer art is inextricable from its function, and that its excesses are most often denigrated as “camp” by those most invested in its invisibility. (“What is ballroom without a little DRA-MA?” Pray says succinctly.) The result is a series so remarkably unlike anything else currently on TV that it comes to resemble a protest, a sign-waving, slogan-chanting, queer-as-a-two-dollar-bill Pride March through American living rooms, one that not only deserves a second season but practically demands it. I knew this from the beginning, in a way: The pilot episode ends with Damon (Ryan Jamaal Swain), an aspiring dancer Blanca takes under her wing, auditioning for a tony training program to my song of last summer, “I Wanna Dance With Somebody.” For me—born in 1987, the year of its recording and of Pose’s first episode—it conjures up a sweaty rooftop in a New Orleans August, condensation on daiquiris and Pisco sours, a dear friend at the turntables, an unrequited love, heady joys and sudden sorrows I’m hard-pressed to believe I fit into a season. For you, of course, the number may be different. But as Pose understands—that presence, that resistance, that breath of life, that song of this summer—I’ll bet it oozes right out of you: None of us can hide our songs for long, because our future still depends on us standing to sing ’em. 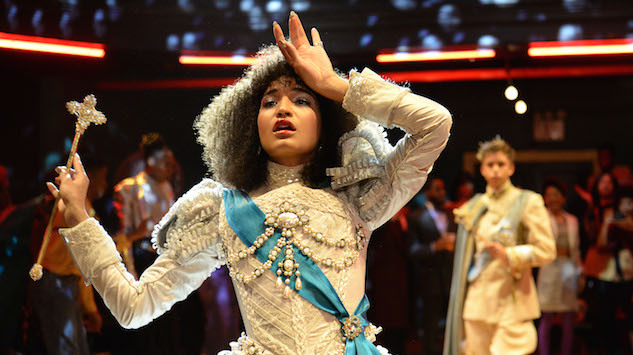 Pose airs Sundays at 9 p.m. on FX.